I’ve always loved using vacuum sealers for their many benefits. Over the years, I’ve also experimented with the process so I can discover the facts for myself. I’ve found, for example, that it’s not really a good idea to vacuum seal some types of food. These include soft cheese, mushrooms, and cruciferous veggies like horseradish, broccoli, cabbage, and Brussels sprouts. I’ve also verified that not all vacuum sealers are equal in quality. I’ve also realized that the FoodSaver V4440 is quite good compared to other vacuum sealers you can get. In fact, once you have such a gadget as this you find yourself finding ways of using it. It’s a great way to preserve leftovers. When I get some food craving at midnight a few days later, the food is still there as fresh as new. I do the same for the canned pet food so that my dogs and cats can also enjoy their leftovers. This is good for “special treats” I don’t give my pets on a daily basis. Then I can also buy fresh meats in bulk. This really saves me a significant amount of money. I can just vacuum seal them all and place them in the freezer, and I won’t have to worry about destroying the taste of the meats due to the freezing temperature. I even use it for preserving snacks! Sometimes I open a bag of chips, but then I couldn’t finish it. That doesn’t mean the leftover chips will have to lose its crispness. I can just seal them in, and then a few days later I can open the bag again when my favorite TV show is on. The FoodSaver V4440 2 in 1 offers two types of sealers in a single design. It works as your standard vacuum sealer, and it really does its job quite well. In fact, it’s better than many others you can get. But it offers a handheld retractable sealer that’s really very convenient to use. With it, you can seal various canisters and containers. What that means is that you won’t need to buy any additional attachments for containers. That saves you a bit of money, and it’s also very convenient. So what else can you use this on? With bags, you can use all types and brands, although you may want to start with the FoodSaver bags. But it also works with special FoodSaver Canisters. You may also want to try out the FreshSaver zipper bags too. These bags use a reinforced double zipper so you can open and reseal the bag whenever you want. At first, I really thought that an airtight seal was a “de facto” benefit of every vacuum sealer. As it turned out, that’s not exactly the case. Some vacuum sealers don’t really offer a tight seal at all. It’s quite disheartening to find this out when you’ve already vacuum sealed a ton of meat and you find that the seal didn’t work as well so you expected. But that’s not the case with the FoodSaver V4440 vacuum sealer. It really does remove all the air inside the bag, and the design can really seal the freshness inside. What’s more, it even has a sensor that automatically detects any sort of leaks and defective seals. So you’ll know right away if the seal is no good, and at least you won’t waste any food due to the snafu. There are many benefits to marinating your food, especially when you’re going to grill the meat afterward. The experts can cite a variety of reasons for marinating, but for me, it’s simply traditional. It just doesn’t seem right to BBQ a piece of meat that hasn’t been marinated. What’s annoying is that you need to plan ahead, so you can’t impromptu BBQs if you want to enjoy marinated fish, meat, or poultry. 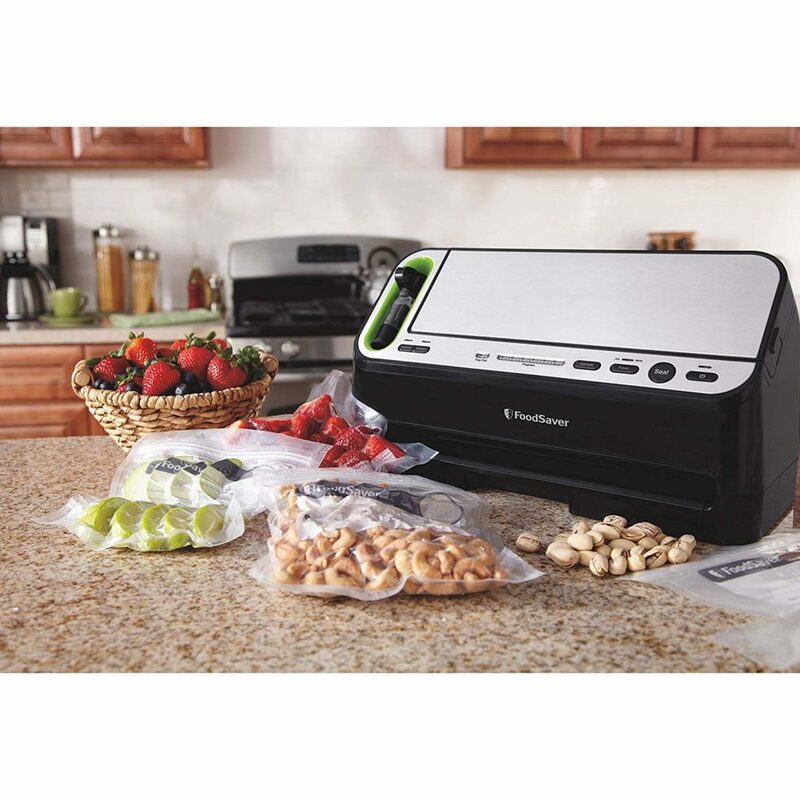 But what’s great is that one of the FoodSaver V4440 vacuum sealers uses is to shorten the marinating time. So you can just pick the perfect marinade you want then you can use a resealable vacuum sealer bag. Just put the meat inside the bag, after you cut it into smaller bite-sized pieces so the meat can absorb more of the marinade. Add the marinade to the bag, making sure that there’s at least an inch between the seal and the marinade. Once you seal the bag, then you can just put it in the fridge for half an hour. For more tender meat, you may want to keep it for an hour or two. That’s still better than having to marinate the meat overnight. 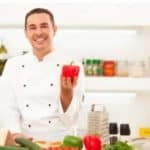 Ever since the FoodSaver model V2440 came out more than a decade ago, FoodSaver has upgraded and improved its technology so that their vacuum cleaners are easier to use. First of all, this is a completely automatic sealer. You won’t have to press the lid down and count the seconds. It will detect when you’ve placed in the bag, and it will start and stop as needed. It also has lots of other convenient features. It has a built-in cutter, so if you don’t want preset bags can customize the size instead. The drip tray also catches any overflow liquids, and you can remove it from the unit and clean it with your dishwasher. It really sets a very effective seal. You can use it for many types of food, including delicate foodstuffs like cookies and muffins. It works for many types of containers without the need to buy attachment accessories. Maintenance is easy, as you just need to wipe it down and you can just clean the removable drip tray in your kitchen sink or dishwasher. The automatic feature may make it a bit hard for you to put in a double seal. It’s still a bit bulky, so it’ll take up a lot of space in your countertop. It may be a bit loud, but personally, I find the sound reassuring. It tells me that it’s working! It works automatically, so no need to press down and count the seconds. It’ll start and stop on its own. It has a retractable sealer you can hold in your hands. That means you won’t have to set the bags just right on the machine. Instead, you can just lay the bags on the countertop and press on the sealer. It works for a variety of bags and containers, so you can choose which bags you like. You can even get custom bags that you can cut with the built-in cutter so that the size of the bag is just right. It offers a marinate mode that can offer you the same effect of marinating meat overnight—in half an hour. The drip tray is removable and easy to clean. Q: Can you really use this for chip bags? A: Sure you can, as I’ve done it lots of times. You can use it for Mylar bags and stiff plastic bags. The trick is to just reseal the chip bag. You don’t have to vacuum seal it and remove the air. Q: Can you heat the food inside without removing them from the bag first? A: That depends. First of all, you should use the right bag. The FoodSaver bags and rolls are specifically designed for sous to vide food preparation. But other bags may not be, so you have to check first. Then you have to keep in mind that you can’t cook food this way. The food inside the bag should already have been cooked. But you can then reheat the food this way. Q: Can you use this for soups and stews? A: Yes, but the best choice is to use a mason jar or a canister. But if you insist on using a FoodSaver bag, you’ll first need to freeze the soup overnight. You’ll need to place it in a bowl lined with plastic wrap. Then you get the plastic wrap and put it in the FoodSaver bag when you vacuum seal it. Q: What’s the difference between this model and the 4980? A: The FoodSaver 4980 also offers a manual feature, so you won’t have to rely on the automatic sensor. The 4980 also features a stainless steel body and buttons. On the 4440, it’s mostly hard plastic. If you go online, you can use Google and find a whole bunch of FoodSaver V4440 reviews raving about it. Add this review to the list, since I understand just why it’s so popular. It’s effective and easy to use, and yet it’s affordable. Not only that, but it is fun to use. After a while, you suddenly find yourself vacuum sealing everything you can think of!